Waiting to board the plane from Oakland to Austin I met five people on their way to QuiltCon. There were even more quilters at the luggage pickup and more at the Super Shuttle. We are multiplying. I've been meeting people right and left and everyone is so happy and excited to be here. Including me! The organizers have pre-sold over 1500 passes. I am so impressed by these organizers and at how organized they are! 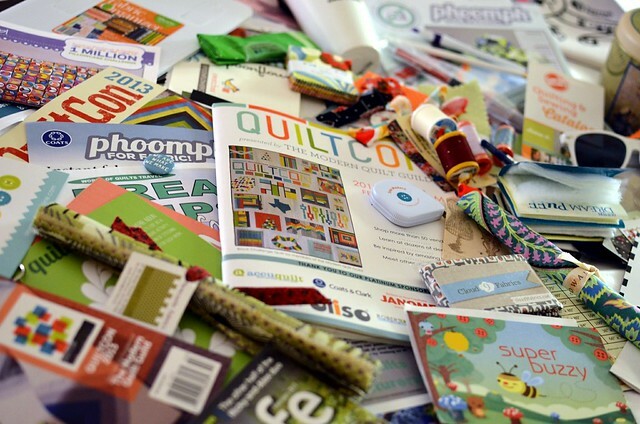 Look at all the goodies that came in my QuiltCon goody bag! This thing weighs a ton! It's filled with freebies like thread, zippers, tailor's chalk, seam riper, ceramic hot cup, magazines, fabric and more. Wow! I had a fantastic meal of stuffed trout and a bottle of wine with my friend Bunnie. 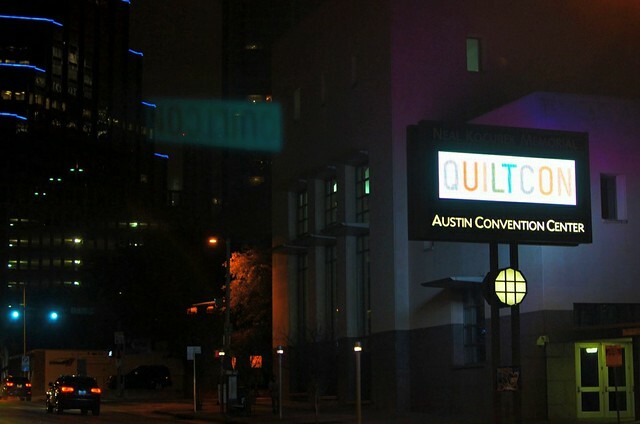 At the restaurant we met several more QuiltCon quilters. Now I'm back at my hotel room. It is so so nice. As soon as this posts I will be snuggling into my king size fluffy bed for a good night's sleep. I'm teaching my first class bright and early at 9am.